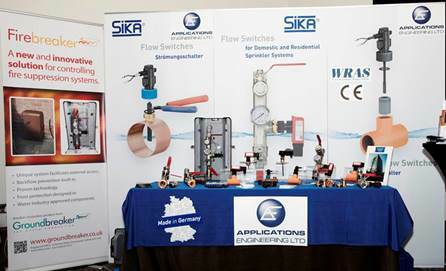 Following on from the success of exhibiting at BAFSA’s Fire Sprinkler 2010 and 2012 events we had the pleasure of taking one of 37 exhibitor stands at the prestigious Fire Sprinkler International 2014 exhibition and conference held at The Grange Hotel in central London in May 2014. Attended by more than 300 delegates, it was deemed by all concerned as a huge success and we were delighted to be able to invite to share our stand and to introduce the new product launched earlier this year to the sprinkler industry – the Firebreaker™. Together with Firebreaker™ we were pleased to welcome existing users and installers of our products on to our stand and delighted at the number of new customers we have gained as a result, with many more organisations, including members of the fire service, expressing a keen interest in our range of flow switches and variety of sprinkler valvesets. As a result of our increasing exposure to the Fire Sprinkler industry we are very pleased to announce that we have applied, and been accepted, as members of BAFSA and will be proud to include their logo on much of our new documentation and digital images. We would like to take this opportunity to congratulate BAFSA on the celebration of their 40th anniversary and to thank their Council for accepting our application for membership.